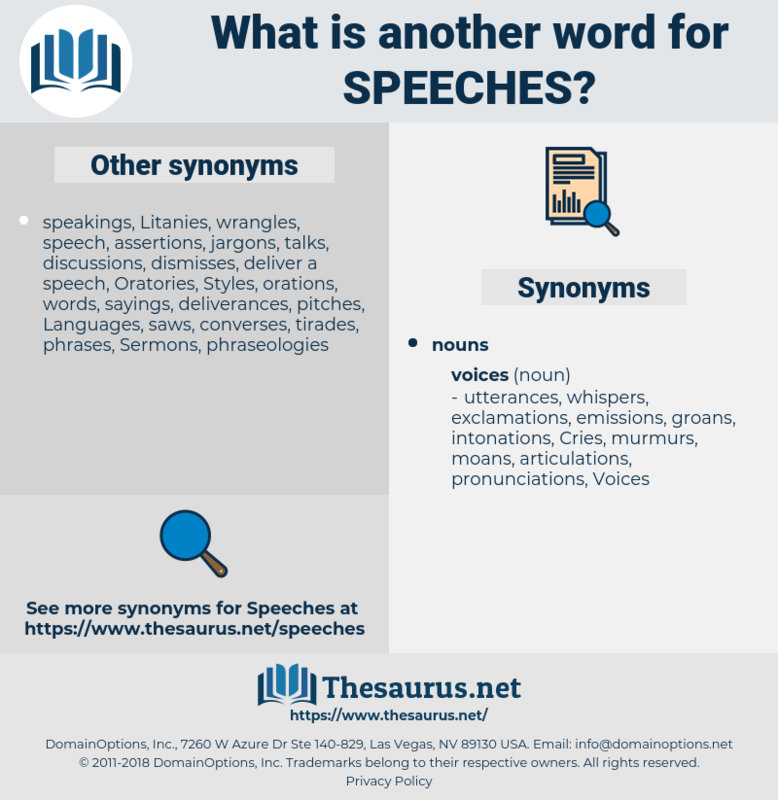 What is another word for speeches? conversations, expressions, utterances, Sermons, Interviews, arguments. declarations, expressions, representations, letters, reports, notifications, indicators, claims, returns, Filings, remarks, statements. remarks, secretary-general, EBSM, input, Addresses, statement, statements, interventions. 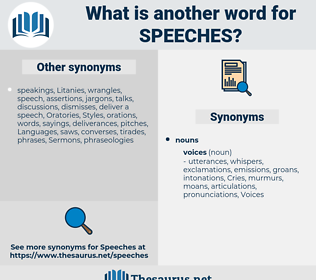 speaking, communications, speakers, phrases, declarations, circumstances, purposes, messages, proclamations, Lectures, parliamentarians, proceedings, performances, 'interventions, appearances, representations, terms, Telecommunications, Testimonies, briefings, papers, considerations, operations, Languages, keynotes, letters, manifestations, misrepresentations, pronouncements, self-reports, sentences, discussions, transactions, Commentaries, comments, Voices, Gestures, Hearings, occasions, steps, reports, depositions, interpreting, understandings, appropriations, introductions, contributions, pledges, initiatives, explanations, interveners, chat, approaches, sessions, Measures, resolutions, stakeholders, acts, changes, panellists, talking, exhibitions, Conferences, interpreters, criticisms, schemes, Translations, things, observations, rapporteurs, MEPS, pieces, notifications, seconds, deliberations, instances, outpourings, disclosures, lecturers, predictions, exposures, assertions, minutes, outcomes, CBMS, communiques, quotations, incidents, registrations, responders, assurances, quotes, Exercises, designations, dealings, assignments, opinions, debates, positions, affirmations, delegations, wordings, allowances, Charges, times, expenditure, reflections, Schools, Investments, exhibits, touches, Records, affidavits, pleas, talks, implications, causes, engagements, senators, questions, Judgments, Replies, Patients, translators, ways, themes, contributors, requirements, practices, improvements, experiences, providers, moves, displays, surgeries, transfers, admissions, thoughts, versions, Yours, briefs, encounters, segments, envelopes, sales, Policies, Attitudes, endeavours, Respondents, Guidelines, colleagues, inputs, means, offences, allocations, intervenors, bills, Activities, tongues, plans, programmes, sittings, allegations, Gentlemen, samples, Crises, players, STRS, Databases, treatments, IMPACTS, notes, grounds, projects, inventions, rulings, points, notices, answers, reasons, raids, runas, networks, Forums, payments, Clients, lyrics, bail-outs, donations, Premiums, benefits, logging, Ideas, Roles, Soils, designs, calls, TELECOMS, views, Efforts, Ones, informants, signs, Entries, applications, offers, Stories, actors, media, members, items, upgrades, indicators, Grants, requests, claims, limits, nets, Fees, Subsidies, rumours, filers, contacts, data, returns, files, accounts, features, DUES, quotas, Filings, offices, counts, Forms, figures, sorts, meetings, remarks, Addresses, statement, statements, interventions. speaks, Lectures, works, aims, Measures, Addresses. We have always loved each other, and I think more of him than ever since I lost my voice, and he has ceased making serious speeches to me that I can't understand. These are facts that no amount of words can cover, no speeches explain away.